In the early days of fonts, each glyph was stored as a bitmap at a range of sizes. Drawing it was a simple case of picking the right sized image of the glyph and putting it on the screen. This let designers add and remove details at various sizes to make the text readable. 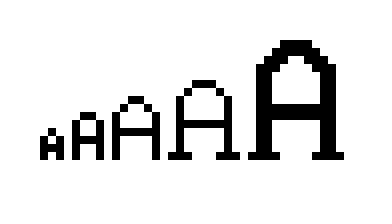 A very simple bitmap font – note the disappearance of the serif (the ‘feet’ on the bottom of the stems) in smaller versions. This in no way resembles an ‘M’! Some font renderers are now so good at guessing how a glyph should look at certain sizes that they ignore any hinting data provided entirely. This is particularly noticeable on OSX. PostScript fonts use values to describe typical features of the font, and then add operators into the glyph description which tells the renderer where stems are. The renderer then uses this information to render the glyphs as well as it can, keeping stems solid and separate, making sure the bottoms and tops of glyphs line up, and making curves appear rounded if possible and flat if not. 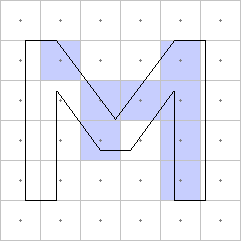 TrueType hints come in the form of little programs which move the points around based on the point size and resolution. 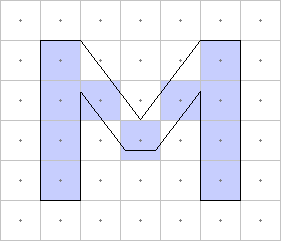 This allows the designer complete control over how the outlines react to different sizes. This system has also been used by some fonts to construct new glyphs by combining other glyphs which are just brush strokes and then shifting and reshaping them. We’ve even got a video of that all happening in our very own TrueType hinting debugger. We’ve been working hard to make sure that all of our converted fonts have good hinting data so that they’ll look great in browsers. Why not try it out and see what it can do? At last! NOW I know what Font Hinting is! Great, interesting and easy to read article. Thank you very much!